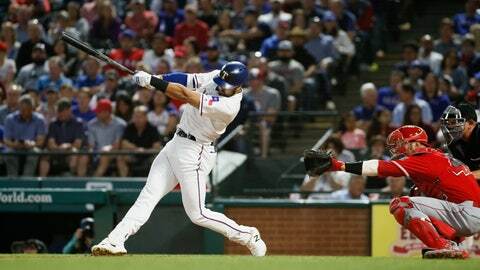 ARLINGTON, Texas (AP) — Joey Gallo clubbed one of his typical long ballsto get the Texas Rangers even against the Los Angeles Angels. Gallo grounded the go-ahead hit through the vacant spot at shortstopagainst the shift, helping the Rangers beat the Angels 12-7 on Monday night in Mike Trout’s return after the Los Angeles star missed three games with a groin injury. Trout, the designated hitter while the club waits a little longer before putting the two-time AL MVP back in center field, went 0 for 2 with three walks. Trout scored twice, including on Brian Goodwin‘s second homer , a two-run shot in a three-run first. Goodwin added a sacrifice fly. Bedrosian (1-1) allowed five of the seven hitters he faced to reach, starting with Elvis Andrus‘ leadoff double in the fifth. Two runs scored on Isiah Kiner-Falefa‘s RBI single when right fielder Kole Calhoun‘s throw home skipped past Kevan Smith, allowing Gallo to score. More LA sloppiness that didn’t result in an error helped Texas erase a 4-1 deficit in the third. With Danny Santana at third and one out after Choo’s homer, Nomar Mazara‘s high popup near home landed between Albert Pujols and Smith, with the first baseman gesturing to his catcher that it should have been Smith’s ball. Mazara’s groundout scored Santana before Gallo homered.